Incepted in the year 1995, Air Care Equipments is among the fastest growing organization engage din the manufacturing, exporting and supplying of a diverse array of cement industry equipment, paper industry equipment, chemical industry equipment, and various filtration systems etc. Our range of filtration systems and equipments have gained acceptance worldwide owing to their optimum performance and reliability. Our state-of-the-art infrastructure and a competent workforce enable us in producing industrial equipment and filtration systems of flawless quality. The union of two has well positioned us in the industry and has allowed Air Care Equipments, Pune to cater to the requirements of our clients as pert the technical specifications provided by them. Moreover, our experts keep themselves abreast with the latest technological developments that help us in upgrading our product line from time to time. Owing to the extensive industry experience and sharp business acumen of our mentor, Mr. Chandermohan Gupta, we have been able to develop an innovative range of industrial filtration systems that are widely used in various industries for air filtration purposes. Under his proficient guidance, we have been able to fulfill the demands of our clients and reach beyond their expectations by consistently providing a premium assortment of industrial equipment as per their needs. Being a quality conscious organization, we are dedicated towards providing our clients with superior quality industrial equipment. To ensure that every equipment produced by us is of premium quality, we have a quality control department that ensures that only flawless products are offered tour clients. Our quality experts maintain a strict vigil throughout the various stages of production, starting from the time of procurement of raw material upto the final stage of storing and dispatch. All our equipment are manufactured in compliance with 2825 standard and are checked on various parameters before final dispatch. Manufacturing a wide range of cement industry equipment, paper industry equipment, chemical industry equipment, etc., necessitates the presence of a team of qualified and experienced professionals. We are proud that we have with us such a dedicated and talented team of professionals who have immense knowledge of the industry that helps us in offering world-class equipment to our clients. Our workforce comprises of different teams of engineers, technicians, quality controllers, sales and marketing personnel, packaging experts and skilled labor. The sincere efforts of our team have played a significant role in reaching the level of success achieved by us. Their dedication and hard work is the key to the position that we have been enjoying since our inception. 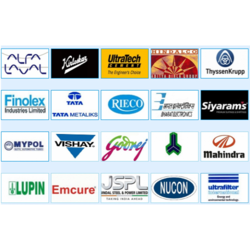 Well versed with industrial processes, these professionals invest their valuable experience in customizing our range with precision and as per the specific needs of our clients.